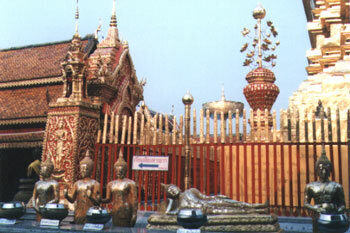 Golden Buddhas surround the octagonal, Lanna-style Central Chedi of Doi Suthep. A revered Buddhist shrine in the hills above Chiang Mai, showing the influences of Shan/Burmese and Lao traditions. As an act of merit-making, devotees apply gold leaf to the Buddha, and leave offerings of Lotus flower, candles & incense.